This happens to be my latest addition or you may call addiction to Pilot Pens. After buying and using PILOT CAPLESS I realised that I need more Pilot Pens and lot of fellow fountain pen users and friends recommended me to buy Custom 74 and here I must thank Dhruv for connecting me with Bunkidou Shop. Dealing with Bunkidou was an amazing experience and his service was excellent. I actually bought two PILOT pens from him, CUSTOM 74 and CUSTOM HERITAGE 92. And the EMS service was so amazing that the pens reached to India from Japan within 5 days. I will be doing reviews of both, however this review is about PILOT CUSTOM 74 WITH MUSIC NIB. The pen is regular sized classic cigar shape pen. The pen comes in various colours like Black, Burgundy, Dark Green and Dark Blue with gold trims. There are demonstrator versions also available with chrome trims also, but the music nib is only available in Black colour in Japan. The classical cigar shaped pen is thickest at the cap centre-band and cap tapers down to rounded finial at top. The finial is visually separated by gold colour band. The clip is stiff and sturdy and has a ball end. The cap has dual centre band, with slim one at top and broad one below where branding is done and reads “PILOT – MADE IN JAPAN *CUSTOM 74*” . The clip also displays the the brand name PILOT engraved. The pen is extremely well detailed out. There is a gold colour band at the bottom of barrel separating it from the bottom finial and also there is gold colour band at the bottom of grip section (as you can see from above image) separating it from barrel. The material used is plastic resin which is of same quality as Pilot 78G, thus nothing premium in that regards.The material is very well polished and finished. The quality control is superb and amazing and that is where Pilot excels. The pen uncaps in 1 – 3/4 turns and the grip section is slight concave albeit just a little bit. I actually wanted to buy demo version but music nib was not available available in any other colour, so I had to settle for this. But this black colour has grown over me because of its classical, understated and professional look. The pen is made of resin and is light weight and superbly well balanced whether you write with cap posted at the back or not. yes the cap posts securely at the back. The pen is of regular length comparable to that of Lamy Safari as shown in comparison above. The pen is slim and the grip is perfect. Pen is very ergonomic. I absolutely love this pen because of the grip and balance. Now comes the best part for which the pen was bought irrespective of the colour and by the way this colour has really grown on me. It looks so decent and professional. Well the pen comes in various nib widths, EF, F, SF, SFM, M, SM, FM, B, BB, MS, & C but the I am here using Music (MS) nib which has 3 tines. The friction fit nib is #5, 14 K Gold nib and writes amazingly soft and wet. I would say it writes fairly wet on higher medium side. The nib offers amazing and precise line variation . Its actually a kind of very wet stub and thus it helps in shading a lot. Even this black ink shades a little bit. It suits my script writing very well. Writing cursive with the nib gives you a feedback but by no means it is scratchy. Feed is made of plastic. When first I inked this pen it used to get dry but after flushing the pen its a loveliest wet stubby pen I have. Ink just dries at 25 sec mark. The pen actually came only with black ink cartridge so had to purchase the converter separately. It actually takes all the Pilot proprietary converters , CON 20, CON 50, CON 70 and also Pilot cartridges. I like CON 50 because its easy to fill and clean and also I like its small ink capacity because I like changing inks. The pen can not be used as eyedropper because of metal tenon underneath the grip section which accepts the cartridge or converter. The pen is no nonsense , classic looking pen. And at 82 USD shipped via EMS from Japanto India in 5 days, its terrific value for money. Cant beat that. Lot of retailer are selling it at 160 USD. So buying via Rakuten really helped. I recommend this to all the fountain pen users who like using stub nibs. Must buy. I am a student of 12th class and have saved approx 9k and wanted to buy 2 platinum 3776 century and can get 2 of them from Amazon Japan if there will be any customs duty I cant buy these as this is a secret and how to pay for that. Did you pay any custom duty for this shipment? I happened across your blog doing some research on fountain pens. I’m looking to buy a Pilot Vanishing Point (F), Matte Black. I saw that you have used the VP and I can’t seem to find it at my usual sources. Any leads on where I can buy genuine Pilot VP in India? Preferably in Bangalore or online. That’s a great review and it is one more such review which fuels me to buy the custom 74 (I’m gonna get the Fine Nib). Wish to get my hands onto this beautiful writing instrument soon. thank you for the appreciation…. Strange I can’t reply to your comment. I didn’t understand what is massdrop, now I get that it’s an online community. I signed up and requested there. Hope to get one retro pop soon. And thanks for replying and reading that large wall of text! You have much information to get pens at the right price. Thank you once again. You can reach me on the email and also the phone no. Since you are a fan of Pilot pens I wanted to ask you that where can I get the Pilot MR Retro Pop fountain pens? I also wanted to buy a Pilot Metropolitan in plain black without any accents, but it isn’t available here in Mumbai (I checked the whole Flora Fountain area). But Pilot MR pens are available at Luxor’s website, Amazon and Luxor’s eBay. But every one of them is selling MR with animal accents I wanted a MR in plain black and a MR retro pop too. I e-mailed them twice asking for plain black and retro pop series, but they haven’t replied me till now. It’s been over 15 days. So I have lost hope from Luxor. I have checked eBay Global Easy Buy and Retro pop is available there around ₹2500, but that’s way too expensive for me since I am just a student and at that price I can get two metropolitans along with a Waterman ink bottle. So can you please tell me that where can I get a Metropolitan in plain black and if Retro pop is available in India? There is currently mass drop offer on Pilot MR.. And they are pretty cheap… As far as black one without accents you will have to get that from Japan… Its sometimes called Cocoon there. I see. So where can I get a “pretty cheap Pilot MR”? The regular pilot metropolitan is also available in plain black (http://www.jetpens.com/Pilot-Metropolitan-Fountain-Pen-Fine-Nib-Black-Plain-Body/pd/12075) it’s just that it isn’t available in India! And shipping from US to India along with customs means almost the pen’s price. Cocoon is available in plain black too, but they say that it’s nib is better than MR. It’s available at Global Rakuten around ₹1500 and shipping is around ₹600. Does it include customs? And would it be delivered at doorstep or do I have to go to customs office to get that? Lamy safari is available at ₹1300 (shocked!) it’s available around ₹2000 here everywhere in India. Any slightest idea where can I get retro pop in India? I am in love with red and turquoise. And I am repeating this again! Where can I get your cheap Pilot MR with the mass drop offer? Haha. Thanks. Well you can try with PenIndia (jegraul@gmail.com) . Although they dont list it at thier webpage but you can try emailing them. 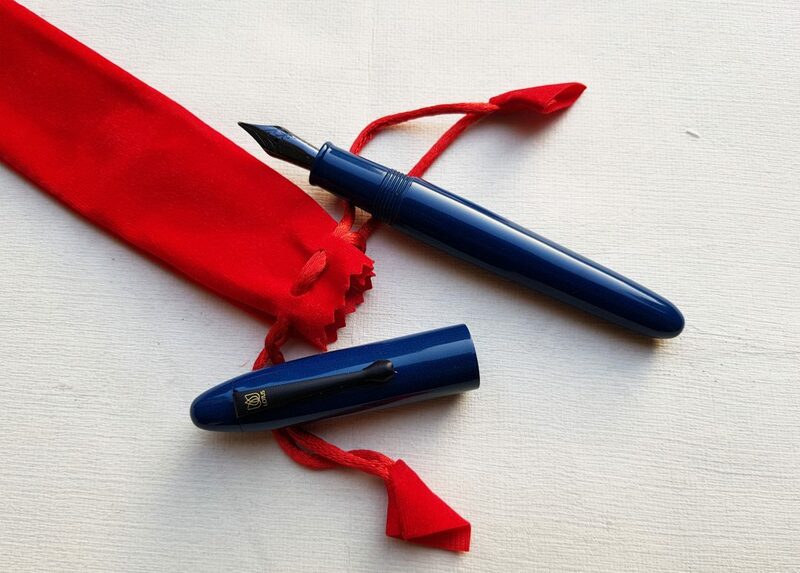 Lastly as far as Lamy is concerned buy it from …Fontoplumo (https://fontoplumo.nl/shop/en/34-lamy-fountain-pens) , they have the cheapest rates after applying discount code…. As always Vaibhav you have come up with another gem of a review. This is another amazing review. The detailing of pen, handwriting, photography. . All are awesome. And top of all, I love my name written by you.. thank you..
Nice review Vaibhav. I am tempted to get one of these. Music nib is one step ahead of stub nibs.. Because of wetness.. But its more favorable for script writing.. Rather than cursive.. Seems like a must buy after reading u r beautiful blog. Hearty congratulations on acquiring this beautiful pen. Nice pictures and a good review too. The finishing touch of writing the name of u r wife is beautiful.